There is no doubt that spring has officially sprung across much of the lower forty-eight states, and as old man winter begins to loosen his grip it is only a matter of time until the predawn air is filled with the sound of gobbling long beards. Spring turkey hunting is the favorite past time of many sportsmen and women across the Country, and although the open day of turkey season may still be several weeks away, the time to begin scouting for turkeys is now. As game species, the wild turkey is often underrated by many and is perceived to be a somewhat easy target to pursue. The term “bird brain” pretty well sums it all up, and with the art of “fanning” beginning to become popular, many hunters are beginning to subscribe to the notion that turkey hunting isn’t as difficult or challenging of an activity as many would make it out to be. Now, you don’t have to be a veteran at turkey hunting to know that those who subscribe to the philosophy mentioned above are only fooling themselves. Turkey hunting, aside from often being physically demanding, requires that the hunter uses every tool at their disposal to put themselves in a position to be successful and sometimes that still is not enough to get the job done. Turkey hunting success can ultimately be tied to one simple thing, and that is scouting. Scouting turkeys is the name of the game, and mid-march is an excellent time to begin to do just that. During the early spring months, wild turkeys will often still be in their winter groups with hens and poults from the previous year comprising one group and gobblers and jakes comprising the other. Both groups will often utilize the same feeding and roosting areas, however, they will not begin to disperse until later in the spring. Although still in the bachelor groups, gobblers will begin to strut and gobble starting in mid-march, especially during crisp, cold mornings. This is no doubt that hearing a gobbler screaming on the limb can help make scouting turkeys an exciting and fun activity for anyone, regardless if you are beginning turkey hunter or a veteran. As the spring continues to progress, groups of gobblers will begin to break up into singles and pairs, with calling and displaying continuing to increase as well. Turkey hunting is all about dedication and preparation. You need to be able to understand the day to day lives of the gobblers that reside within the area that you will be hunting. Determining where the turkeys on your property roost and feed as well as locating strutting zones are all important pieces of information that you need to have. In addition, having an understanding of the overall number of turkeys in your area is also an important piece of information to have at your disposal. While hitting the woods at dawn to listen for a gobbling long beard is an effective turkey scouting technique, it comes with its limitations. Turkey’s move, and depending upon where you are, can move a great distance over the course of the day. Just because a turkey roosts on your farm does not mean that he will be there later in the morning. It is important to do your best to use all the tools at your disposal to help you when it comes to scouting for turkeys. Believe it or not, a game feeder and a few trail cameras can really help you when it comes to scouting turkeys and getting set for your turkey hunting adventure. If you use these tools to your advantage, you can begin to develop an idea of not only how many turkeys you have on your property, but what areas they are using and when. Wild turkeys love cracked corn. It is a source of carbohydrates and is easy for wild turkeys to forage on. Better yet for the hunter, cracked corn is relatively cheap and for the purposes of scouting for turkeys, a little corn can go a long way. Before using a game feeder and cracked corn as a means for scouting for turkeys, be sure to check the local regulations in the state that you are in to ensure that you are legal; however, if the use of cracked corn is authorized in your state then you are well on your way to gathering some serious intel. game feeder for the purposes of scouting turkeys is really an easy process. The first step is to identify an area that you either know turkeys will be passing through or utilizing at some point during the day. Try to focus in on areas that you feel turkeys may be utilizing later in the spring, during the turkey hunting season. This will help you to rule out any unintended perception bias from the trail camera photos. 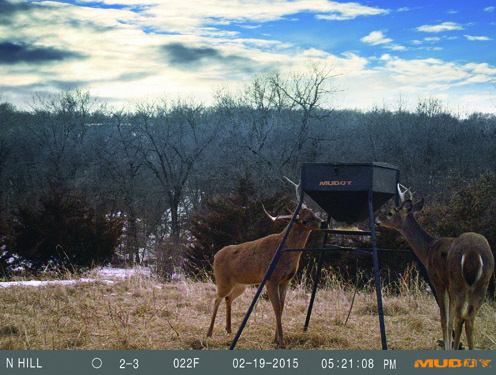 Once you have your location selected, you can set up your game feeder and get to work. It doesn’t take much corn lying on the ground to get the attention of wild turkeys. In fact, for the purposes of gathering trail camera photos, less is more as it will deter other wildlife such as white-tailed deer from staking a claim. Check the game feeder periodically, however, use caution and do your best to avoid bumping any turkeys off the area. When it comes to turkey hunting, and specifically scouting for turkeys, trail cameras are your friend. Trail cameras, especially when live video is available, can provide you with some real-time information that will certainly help you to start developing your turkey hunting game plan for the spring. When it comes to utilizing trail cameras to scouting for turkeys, the philosophy is simple, you want to have as many cameras out in areas that you feel a gobbler may use at any given time and you want to be able to check the cameras as often as needed without bumping birds. This is, of course, easier said than done, however, your life becomes much easier if you are utilizing trail cameras that are enabled to stream live video to your laptop or mobile device. Having the ability to check your cameras remotely allows you to avoid running the risk of spooking any of the turkeys on your property while still receiving valuable information. If you are utilizing cameras that require to manually check the cards, where and when you check your cameras becomes a little more important. If you are setting your cameras up in areas such as strut zones or roost sites, the mid-day hours are an excellent time to check your cameras. If you have your cameras set up next to your game feeder, things become a little more challenging as wild turkeys could be using these areas at any given time, so proceed with caution. Though it is a simple method, using a game feeder and a few trail cameras to your advantage can really help your gain a better perspective on the number of turkeys in your area and help you to begin to pattern their movements. This is critical information to any turkey hunter!